Just got radio and updated to nightly build for this radio and now I have a blank screen. Probably Tx filesystem is damaged. Try to format USB drive and write filesystem from firmware archive. Last edit: 09 Jan 2018 01:28 by berserker_aerial. Ok file system and firmware are working like they should . Press ENT, enter Transmitter menu, enter Transmitter config, scroll down to LCD settings, set Backlight and Contrast to your taste. Then calibrate sticks along with rotary knobs. If clean install (flash firmware, format USB drive, copy filesystem) doesn't help, it look like it is a hardware problem. What battery do you use? Level of charge? Do you use "Safely remove hardware" after copy filesystem? Last edit: 10 Jan 2018 05:25 by vlad_vy. Hello, I have the same Problem, I got my Transmitter yesterday. I think it`s a new revision with the USB Port diagonal in the transmitter case. 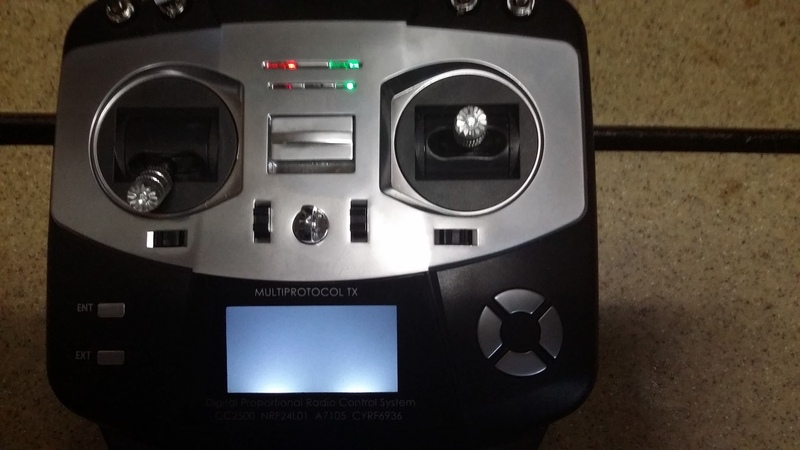 I was not able to bind with a Flysky FS-ia6 Receiver so I decide to do a Software Update. After flashing the Display isn`t readable. 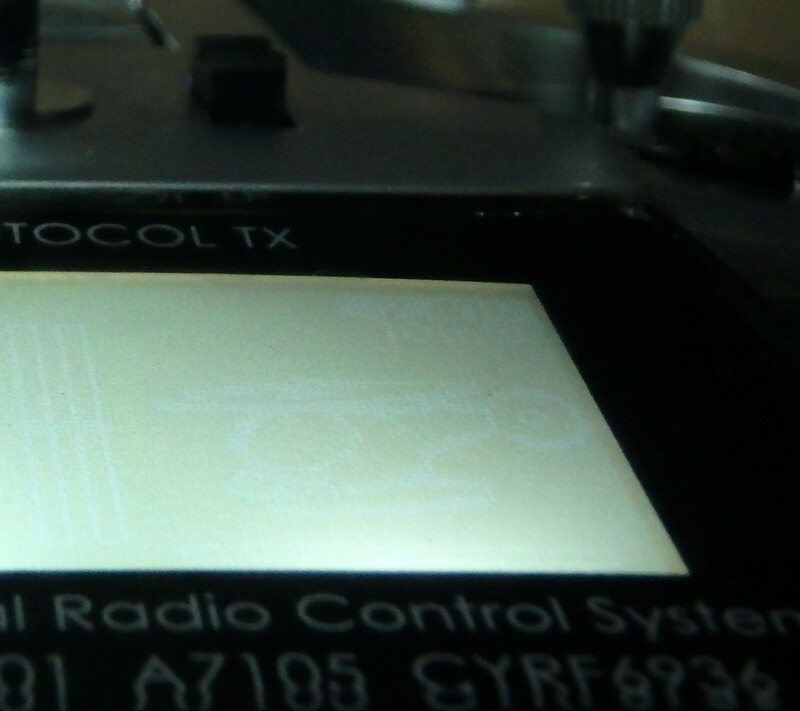 I managed to go to the Positon LCD Backlight and Contrast, but no chance, the Display font is no more readable. I flashed latest stable Builds and all other Nightly al withe ete same resault. Any Idears? It looks like Jumper changed LCD (RXK12864-16-9) without notice. Can you remove mainboard and read LCD marking? Can you see anything on the screen with firmware update mode? By the way, if I remove all files at USB drive, I have white screen that dim over some time. So, it can be damaged filesystem. Use "Safely remove hardware" if you change anything at filesystem from PC. Last edit: 10 Jan 2018 13:18 by vlad_vy. Hi, on LCD is no font. The Mainboard is T8SG-V2. I tried Safetly remove hardware. 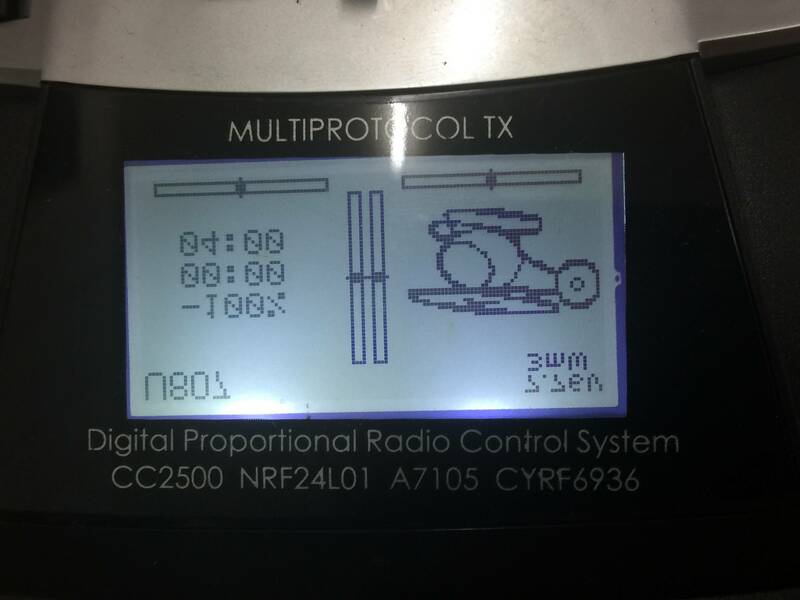 I can`t read any Letter on the LCD. That's why I ask - Can you see anything on the screen with firmware update mode? If it is LCD with devo7e contrast scaling, we have to see bootloader screen. The first photo of this topic is completely the same I can see with empty T8SG USB drive. If I press ENT I can see scrollbar at the right. Last edit: 10 Jan 2018 16:10 by vlad_vy. Anyway you can flash devo7e-256 firmware for testing. The screen will be vertically inverted, but will possible to test contrast setting. Last edit: 10 Jan 2018 16:33 by vlad_vy. I flashed 7e-256 firmware, same result, the contrast is too low, crazy. Are you sure that your battery fully charged? What battery do you use? If you need me to take main board out Incan look at the markings and and send pics ..
Is there any way to back up my radio and send to you to view it .. I Will do what it takes to get you the information you need .